Cress suffers something of an image problem. There's no doubt that growing it on the windowsill is a great way for youngsters to learn about germination, but we seem to have forgotten that there's more to it than skinny white stalks topped with a couple of immature leaves. I don't really see the point of growing cress only to scythe it down when it's barely got going and I'm moderately confident that, once you've tried the grown-up version, neither will you. For the effort of sowing a few seeds that would otherwise provide about enough garnish for a cheese sandwich, you will, by letting cress grow, gain handfuls of leafy growth. 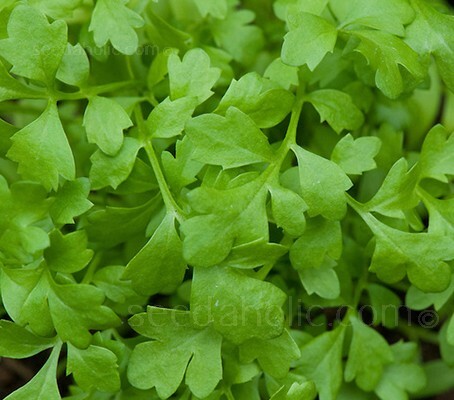 Greek Cress is one of the finest selections of Cress available. It is a variety of garden cress that has a more pronounced, sweet nutty flavour with a slightly spicy kick and lingering peppery taste. The plant exhibits a compact growth of dark green, flat dissected leaves. Fast growing, it can mature in 20 to 30 days from sowing. It is suitable for growing as a baby leaf and using in salads, or growing to maturity and used in stir-fries, curries, chicken, salsa and as a garnish to soups. Greek Cress is for grown ups and deserves to be more widely grown. Sowing: Seeds can be sown all year round. Cress is one salad ingredient you can be sure of harvesting all year round, adding flavour to salads, sandwiches and omelettes. You only need water, a little warmth, and light, and this stuff will grow pretty much anywhere. You don't even need a garden. The great thing is that cress is something that you can grow on the windowsill all year round, or sow directly into outdoor beds any time frosts have passed. Seeds can be sprinkled over the surface of a pot or sown in the ground in either a block or row, quite close together, 1cm (½in) apart. If cress becomes too hot and dry, it tends to bolt, so it's a good choice for an area that's a bit shady and, for best results, it needs to be grown in soil that remains moist. Because it grows so quickly, it's ideal for intercropping. Mustard and cress are ideal partners, but never plant mustard and cress together if you want to eat them at the same time. Mustard grows faster than cress and so must be sown three days later for the two crops to mature at the same time. The true leaves of cress are feathery and divided and plants grow to around 15cm (6in) high in about four weeks. Leave it longer and it will begin to go to seed, but if this happens don't just throw them out. The fire in the leaves will have died down, but they're still tasty and the tiny white flowers are also edible and provide a tiny mustardy explosion in the mouth. Harvest: 7 to 20 days. If you harvest by snipping stalks just above a leafy growing point, the plants may produce a second flush of leaves, but cress isn't very keen to regenerate, sowing a new batch is a better way to keep cress in production. The disadvantage of cress is that the leaves cannot be dried and thus are rarely traded, in shops the micro leaf plants are sold while still growing in small packages but is almost never available as full grown plants. However, cress grows so easily and quickly in any garden with minimal effort, the plant ready for harvesting as little as a week after sowing. For fresh garden cress, growers use three planting areas or pots and sow in rotation, every two or three weeks to ensure constant supply. Cress tends to lose its flavour when cooked, but it certainly adds texture and a mustardy warmth to any salad. Cress display a spicy aroma and a refreshing, peppery-pungent taste lasting only a few seconds. The aroma components are volatile and susceptible to both heat and moisture, so garden tends to be used fresh rather than being boiled, baked or otherwise heated. The exception to this is Greek Cress, which is hotter and spicier and will contribute flavour to a cooked dish, especially with dishes such as stir-fries which are heated briefly. Lepidium sativum, Cress is native to the Middle East. It was being grown in Persia as early as 400 BC. Garden Cress has the same pungent nip as Watercress does, with medium to dark green leaves. Garden Cress is easier to grow as it can be grown in soil and doesn't require the constant flow of water that Watercress does. The species name sativum (along with sativa and sativus) is derived from the Latin satum and means ‘that which is sown’ indicating the plant is a cultivated one, grown especially for eating. The English word 'season' derives also from satum, as 'appropriate time for sowing', through the old French 'saison'. The English term ‘cress’, is from the Old English caerse and is akin to similar names throughout Europe such as cresson in French and crescione in Italian. These names may be derived from a common source. Latvian griezīgs meaning ‘sharp’, or from the Indo-European root gres ‘devour’, Old Norse kras ‘delicacy’, Sanskrit grasati ‘he eats’ and Greek gran ‘gnaw’. Seed to Sprout: 7 to 11 days.